IDENTIFICATION AND USE: Ammonium metavanadate; is a white or slightly yellow, crystalline powder. It is used in dyeing and printing on woolens; staining wood black; manufacture of vanadium; black and "indelible ink"; producing vanadium; luster on pottery; as photographic developer; in hematoxylin; staining in microscopy; as a reagent in analytical chemistry. Because of its ready conversion to vanadium pentoxide; at elevated temperatures, it is used as a substitute. HUMAN EXPOSURE AND TOXICITY: One worker was exposed to large amounts of dry ammonium vanadate dust over a 6-hr period while shovelling powder into a bin. Within 2 hr of commencing work, retro-orbital headache, tears, dry mouth, and green discoloration of the tongue were reported. There was a marked green discoloration of the skin of the fingers, scrotum, and upper legs. His nose was reported to be stuffy, and he was lethargic. The next day, his testicles were swollen and tender, and, on the third day after exposure, he developed wheezing, dyspnea, and a cough productive of green sputum. He had several small hemoptyses over the following 2 weeks. Wheezing and dyspnea persisted for about 1 month; chest symptoms were at their worst 3 weeks after the incident. On examination 6 weeks after the last exposure, he was asymptomatic, with the exception of a partially blocked left nostril and the reddened appearance of nasal mucosa. Chest examination revealed no abnormality. Pulmonary function assessment showed normal lung volume, forced expiratory flow rate, and gas transfer. He had a mild eosinophilia of the peripheral blood. In human fibroblast cultures VO3- can induce DNA synthesis and cell growth. Ammonium metavanadate; was not found to increase the frequency of structural chromosome aberrations in human leukocytes, whereas a significant increase in numerical aberrations, micronuclei, and satellite associations was found. Fluorescence in situ hybridization (FISH) applied to the human lymphocyte micronucleus assay, by means of an alphoid centromere-specific DNA probe, confirmed the aneuploidogenic potentiality of vanadium;. ANIMAL STUDIES: Acute tubular necrosis, pulmonary hemorrhage, and necrosis of lymphoid tissue were demonstrated in mice receiving 20 mg vanadium;/kg of ammonium metavanadate; solutions. In a 3-month study, rats received ammonium metavanadate; at a concentration of 200 mg/L (in terms of vanadium;) in their drinking water;. Animals exhibited retardation of body weight gain and anemia. Gross pathology examination revealed parenchymatous dystrophy of the liver and kidneys with the formation of cylinders in the tubules in some animals. Neurophysiological effects have been reported following acute exposure (oral and sc injection) of dogs and rabbits to vanadium oxides and salts including ammonium metavanadate;. These include disturbances of the central nervous system (impaired conditioned reflexes and neuromuscular excitability). The teratogenicity of ammonium vanadate was studied in hamsters. 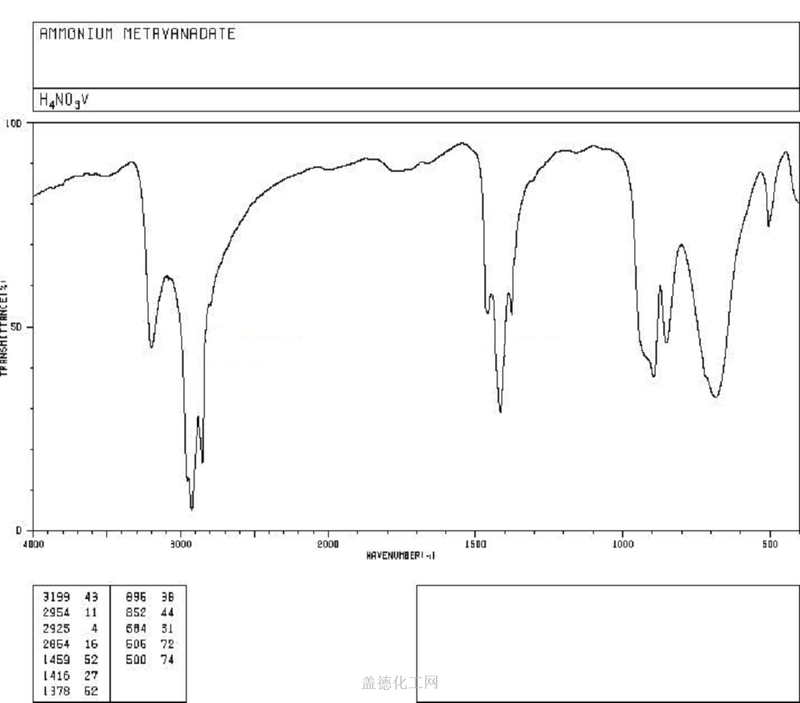 Twenty pregnant hamsters per dose group received 0, 0.47, 1.88, and 3.75 mg/kg of ammonium vanadate by ip injection on gestation days 5 through 10. Pregnant females were killed on day 15. There was a statistically significant increase in skeletal abnormalities and a decrease in the male:female ratio. Ammonium metavanadate; increased the convertant and revertant frequencies in the D7 strain of Saccharomyces cerevisiae; the highest activity was observed without metabolic activation. The micronucleus test was found to be positive for ammonium metavanadate; in bone marrow of mice following intragastric treatment. In contrast, no difference was found between controls and treated animals in the structural chromosome aberration test performed 24 and 36 hr after treatment. In studies with ammonium metavanadate; at concentrations of 5-40 uM, weak mutagenesis was demonstrated at the hprt gene of Chinese hamster V79 cells, and at the gpt locus of hprt-/gpt+ transgenic cell line G12. Female mice given ammonium metavanadate; ip at doses of 2.5, 5, or 10 mg/kg, every 3 days for 3, 6, or 9 weeks, showed a dose-related increase in resistance to E. coli endotoxin lethality up to 6 weeks and a dose-related decrease in resistance to Listeria lethality. Enlargement of the liver and spleen with enhanced formation of splenic megakaryocytes and red blood cell precursors was also observed.